Hobo: I’m gonna sleep in your bloody carcasses tonight! Back in 2007, in anticipation of the horror/exploitation double feature that was directors’ Quentin Tarantino and Robert Rodriguez’s Grindhouse, there was a contest held for others around the world to create their own exploitation film-themed movie trailer, which would be played at the Grindhouse premiere. Canadian filmmaker Jason Eisner won the contest with his trailer for Hobo with a Shotgun. Now, as Robert Rodriguez’s own fake trailer – Machete, has gone on to become a film of its own, Eisner also managed to make a full length feature film version of ‘Hobo’. As a result, Eisner has created a film that is, in some ways, more enjoyable than the other attempts at rejuvenating exploitation flicks. Style, performances, and overall tone have all come together in the best ways possible that are suitable for a film about a bum going gun crazy. 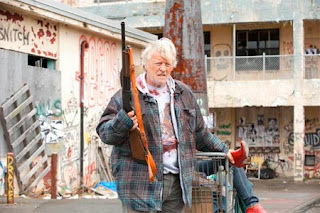 Rutger Hauer stars as the titular Hobo, who I can only refer to as Hobo. Hobo begins the film as a homeless, penniless old man who enters a town by train. He soon learns that this town is ruled by urban chaos. Nasty people roam the streets, the police are mostly corrupt, and the real town leader is a wealthy, demented bully, known as “The Drake” (Brian Downey). Hobo has simply come to town looking to find a way to make some money to secure the best living a hobo can, however, he soon decides that he must do more than just sit on the sidelines. After securing some money, Hobo picks up a 12-Gauge shotgun and starts to dispense vigilante justice around town. No one participating in some form of awful crime is safe, as Hobo begins blasting his way around town, which begins to wreck havoc on all of the nefarious affairs that The Drake is used to plotting. As the film’s tagline suggests, Hobo finds himself delivering justice one shell at a time. Hobo: Lock him up with the sodomites and get me the goddamn chief of police! The obvious statement to make here would be: Do not take this film seriously. Beyond the fact that this film is titled Hobo with a Shotgun, one should be clued into how ridiculous and non-serious this film is by the opening titles alone. Presented just like an older 70s film, one would be right at home double featuring this film with other exploitation films from that time period, as well as a film like the previously mentioned Machete or the very enjoyable Black Dynamite. 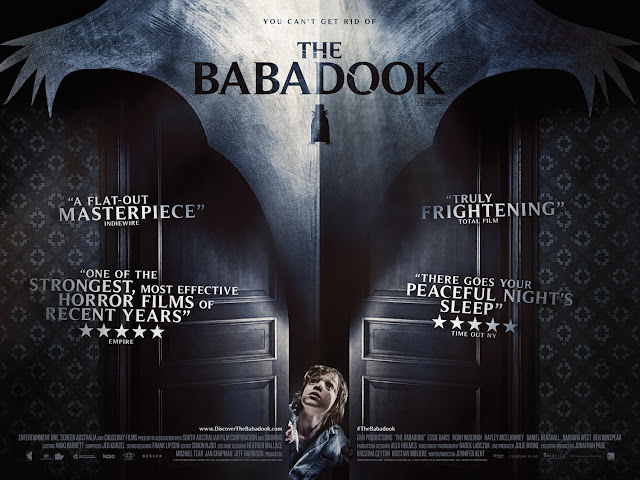 Once settling into this film and the tone that it is going for, there is much to be found within it that suggests the filmmakers involved have a very keen eye for how to produce a film this specific. As far as the style goes, this film revels in the filthiness of its nasty neon glow. The cinematography evokes a definite grittiness that is punctuated with the strong use of bright colors in their dirtiest form. Greens, blues, and especially reds are used quite frequently, and are right in line with the way this film approaches its subject matter. This is an action film, no doubt, but all of the action is presented in true grindhouse fashion – people never reload, exaggerated use of violence, blood, and gore is very prevalent throughout, and all forms of gratuity are never shied away from. This film was made to be exactly what it needed to be, over-the-top, violent, and a comedic joy all the way through. It’s not just tongue in cheek; the tongues go through the cheeks. That said, Rutger Hauer embraces this role whole-heartedly. Hauer has not shied away from genre-type roles before, being known for his roles in films like Blade Runner, The Hitcher, Sin City, and even Batman Begins, but this certainly feels like a bit of a departure. This is not at all a bad thing, as Hauer completely delivers as the Hobo. It is not a matter of how compelling he manages to make the character, but the energy he brings to the role of an elderly homeless man, pushed to going shotgun mad is intriguing to say the least. In a film that is full of (mostly intentional) overboard acting styles, Hauer, dare I say, lends a certain kind of class to the film. 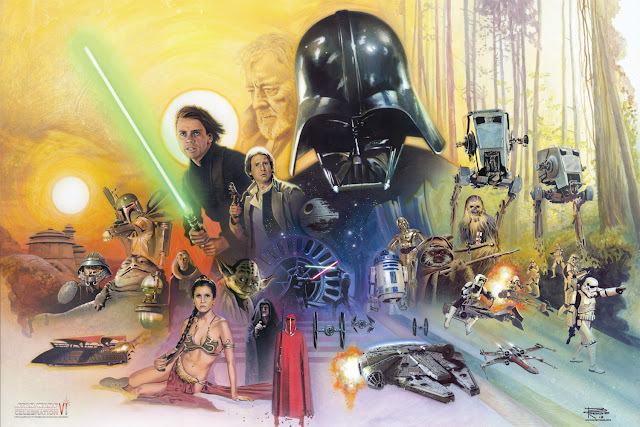 An aspect that intrigues me overall is how well the film adheres to its roots. 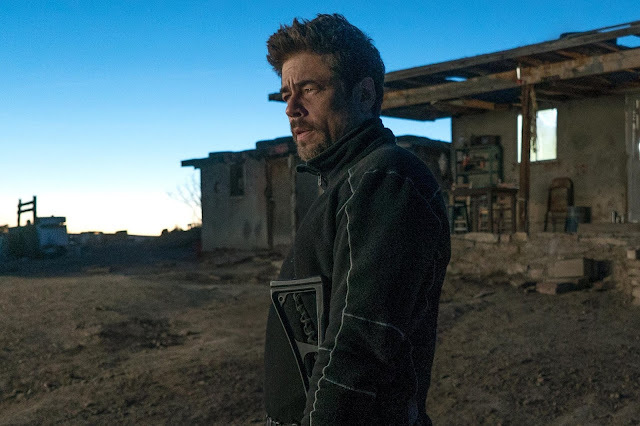 A problem I had with Machete revolved around how off target it became when it decided to introduce a whole wealth of supporting characters and subplots. The story in ‘Hobo’ is much simpler, with focus rarely straying from the Hobo, and the film is all the better for it. It clocks in at a lean 80 minutes, minus the credits, which is ideal for this film delivering all that it needs to, without overstaying its welcome. It is certainly not perfect, with the idea of more being more not always working out for the better, but it is an enjoyable experience for those seeking proper justice in the world of grindhouse and exploitation cinema. I guess I should go ahead and say that this film is not for everyone. I got the exact kind of entertainment I wanted from this it, which is the best kind of compliment I can give. 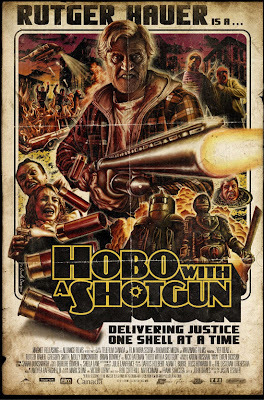 It delivers on whatever kind of promise one could expect from a film titled Hobo with a Shotgun. 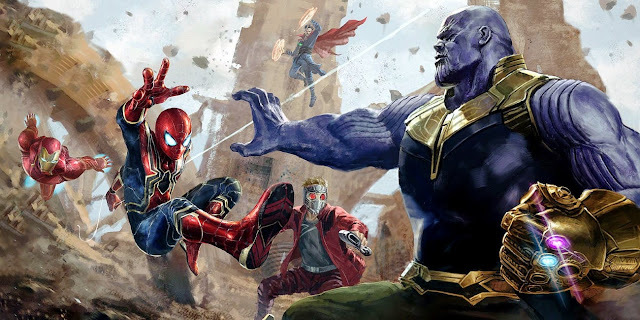 It is well made when it comes to embracing the style of the films it has taken its cues from and handles all of the ridiculous elements in a suitably ridiculous manner. 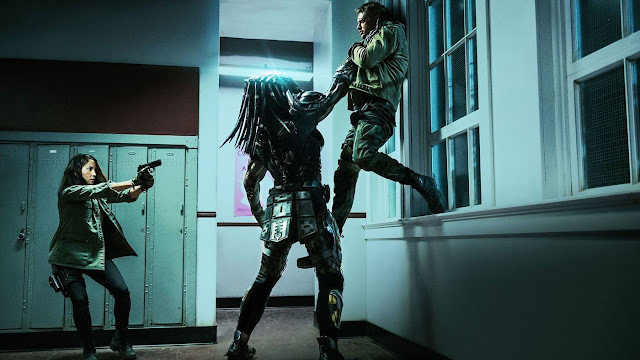 While unrated, this is an incredibly violent picture, made on a low budget, and done so with enough work to make all of the effort put into it show. I am not about to roll around in the trash and pick up a weapon, but when it comes to seeking some solid, violent, genre fun, this is a good step in the right direction. 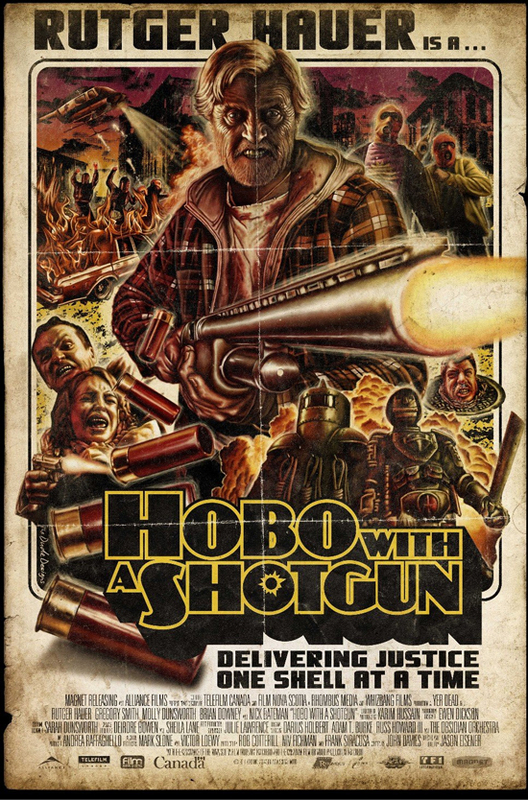 Hobo with a Shotgun can be currently found in limited release around the globe, with a very limited release in the US planned for May 6, 2011. It is also currently available on various internet OnDemand services such as iTunes, the Playstation Network, and Xbox Live. Hobo: [to a group of newborn babies] I used to be like you a long time ago. All brand new and perfect. No mistakes, no regrets. People look at you and think of how wonderful your future will be. They want you to be something special, like a doctor, or a lawyer. I hate to tell you this, but if you grow up here, you're more likely to wind up selling your bodies on the streets, or shooting dope from dirty needles in a bus stop. And if you're successful, you'll make money selling junk to crackheads. And don't think twice about killing someone's wife, because you won't even know it's wrong in the first place. Maybe... you'll end up like me - A hobo with a shotgun.